Download ANSI 405-2018: Standard for Adhesives for Use in Structural Glued Laminated Timber. 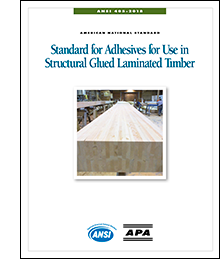 This Standard provides minimum requirements to evaluate adhesives for use in structural glued laminated timber. View the Committee Membership Roster. Click on title to download documents below.